In our days "anti-ecumenists" have a common reference point: the recently proclaimed saint in the Serbian Church, Father Justin Popovich. They use this saint to "brandish" the heads of "heretical ecumenists". As has been written repeatedly and demonstrated de facto, the Emeritus Professor of Theology at Aristotle University of Thessaloniki Father Theodoros Zisis has played a leading role in the "anti-ecumenist struggle" and is revered by "anti-ecumenists". Fr. Theodoros Zisis answers the criticisms of Fr. Justin Popovich concerning the role of the Ecumenical Patriarchate in preparation for the Great Council of Orthodoxy, which he had delivered as a relevant memorandum to the hierarchy of the Serbian Church. Fr. Theodoros refutes the objections of Father Justin, making a brief review of the history and contribution of the Ecumenical Patriarchate during the Turkish period. Attacking the Autocephaly of Greece he refers to the deduction of theology in Greece, and stresses that "Orthodoxy was protected by the Ecumenical Patriarchate also in the precincts of the ancient Patriarchates of the East under hardship, where foreign propaganda strongly clouded through proselytism." Fr. Theodoros considers as "unfounded" the criticisms of Fr. Justin Popovich against the Ecumenical Patriarchate and bases the "unfair criticism" of Fr. Justin on a misunderstanding of his attitude towards Orthodox monasticism and "incomplete and incorrect information" by Fr. Justin. Father Theodoros Zisis emerges in the pages of the article as a great champion of the entire "political" (ecclesiastical, that is) stance of the Ecumenical Patriarchate. Patriarch Athenagoras, who was "anathematized" by the "anti-ecumenists" then and now, is, according to Fr. Theodoros, a personality "who is written about with golden letters in the pages of Orthodox history." The Ecumenical Patriarchate during Patriarch Demetrios also "treaded on this road of genuine observance of Orthodoxy." And to make it clear, Fr. Theodoros refers to a speech of Bartholomew of Philadelphia (now Ecumenical Patriarch) on the Sunday of Orthodoxy in 1976, to an interview with Damascene of Tranoupolis (later of Switzerland and now Adrianople) in an Italian magazine, and, finally, to a sermon of the late Meliton of Chalcedon, who explains the distinction between eastern and western piety. In this article, Fr. Theodoros describes Moscow as "neopapist"! He writes: "And today Moscow is the only example of an Autocephalous Orthodox Church, which does not comply with the Orthodox stance, but treads according to a neopapist way considering itself correct." Fr. Justin had the right and duty to express his views on the "Great Council" and the actions of people working for its preparation. He was wrong however to place on the bench of the accused the Church of Constantinople. All decisions are received democratically and synodically, established jointly by the entire Orthodox Church. He ought by this to grind his teeth towards all directions, and even towards his Church, whose representatives participate always in relevant meetings, and not load everything on the shoulders of the Church of Constantinople, since the hard-hearted sees nothing good. Certainly he does not want to bend the knees of this historic center of Orthodoxy. This will prove a very heavy blow, since the collapse of this pillar will weaken the other foundations, the other institutions. The Ecumenical Patriarchate, loaded with the experience of centuries, proved the ability to maintain the unity of Orthodoxy through the multiplicity of national idiosyncrasies and to develop Orthodox culture, the essence of which is exactly plurality, diversity, and the democratic. What other Orthodox Church could fight to overcome this role without the danger of division, not only by its lack of historical experience, but also through the innovation of this change as well as the possibility of exalting ethno-phylatistic trends? We will return to this timeless article by Fr. 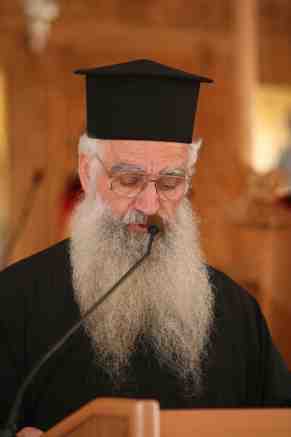 Theodoros Zisis.